Industrial Electric Heaters from Flexiheat UK– Our range of industrial electric heaters with outputs from 3 kW in single phase to 110 kW in 3 Phase, Flexiheat UK has a complete range of industrial electric fan heaters to suit both the industrial and commercial electric warm air heating requirements from small to large areas. Industrial electric heaters are rarely used as the only heat source in the workplace. More typical is that the mainstream heating might lack capacity in the coldest weather, or may not quite reach certain areas of the building. 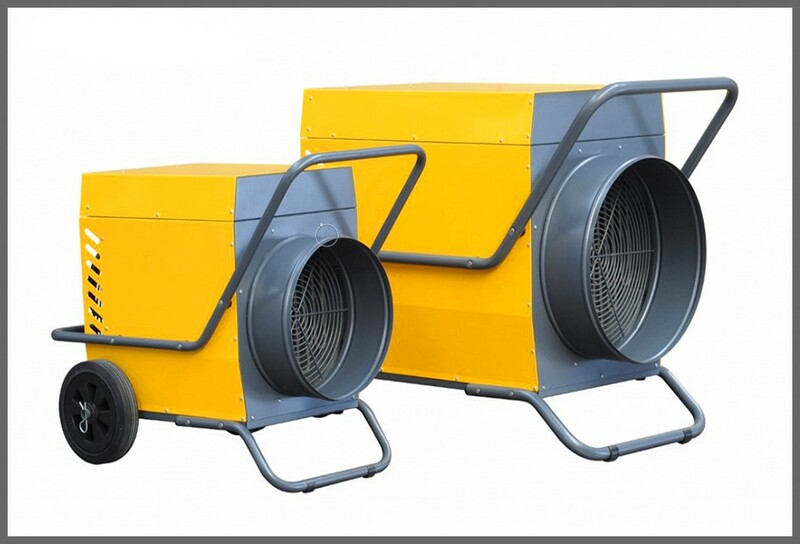 Industrial fan heaters are perfect as a source of supplementary heating. In some applications, the lack of a centralised heating system or mains gas supply forces companies to use electric industrial fan heaters as their primary heat source. Whatever application they are used be it as supplementary heating, emergence heating or as the a primary heating system, these electric industrial heaters are high in their effectiveness, versatility, relative low-cost and ease of installation. 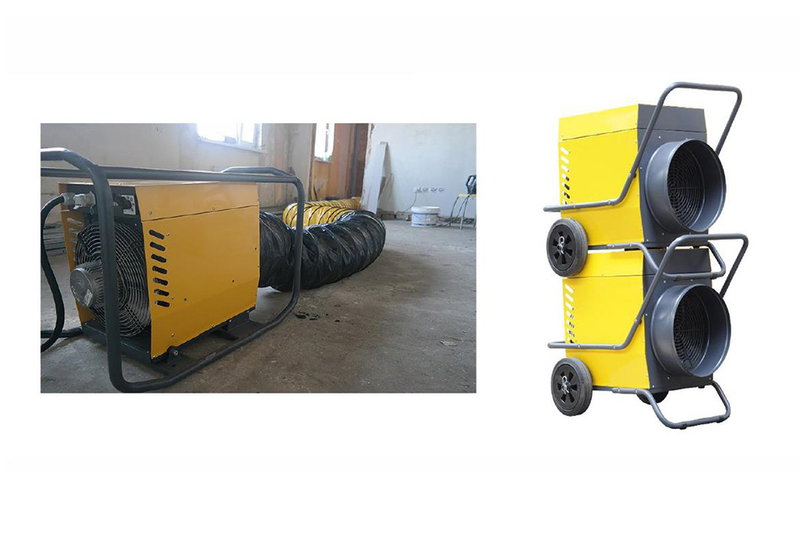 These industrial electric fan heaters are a very safe form of warm air heating as neither naked flames ,nor potentially poisonous emissions are produced such as carbon monoxide ,making these industrial electric fan heaters particularly suitable for use in special applications where the use of traditional fuels such as oil or gas is not permitted. They can also be used in closed environments, as no oxygen is required for these industrial electric warm air heaters to work. You can also use these electric industrial heaters in a fan only or ventilation mode, which is great for moving air around in the summer months. Industrial electric fan heaters – How do they Function ? The heating elements generate heat by the Joule effect and the axial fan produces an airflow that is warmed up as it flows around the heating elements. 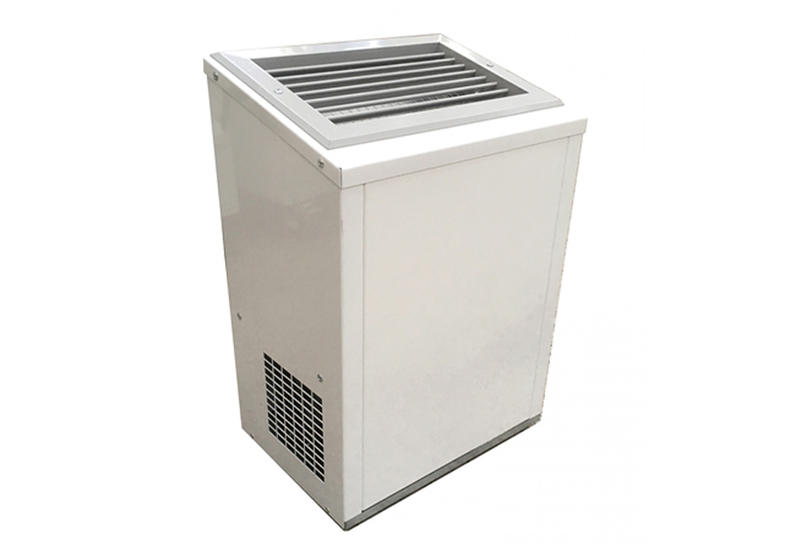 Clean, warm air is discharged from the front outlet.The heating function is controlled by the built-in safety/room thermostat to keep a constant temperature and to prevent overheating.Most of our industrial electric fan heaters can also be fitted with a remote room thermostat to as an optional extra. The use of a thermostat provides an automatic room climate control and the adjustable thermal output allows adjustment of the heaters performance to different heating needs and to reduce energy costs. Delta T is the Industrial electric heater manufacturers ” trade terminology” for temperature change across a heater. In the case of industrial electric heaters, it is the difference between the air temperature going in and that coming out. It varies from heater to heater and indeed in any one heater it will depend in the heat setting and fan setting, however where a fan heaters specification states a delta T (sometimes abbreviated to ΔT°) it means at the maximum heat and maximum air flow. It is typical of industrial electric fan heaters to have a ΔT° of between 40 and 55°C. 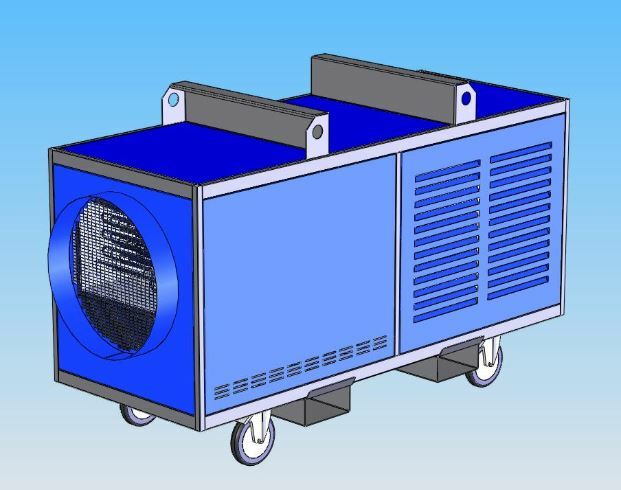 Where higher temperature output is required care is need because fan heaters are designed to operate within a temperature envelope so that if a heater produces a high temperature beyond its design envelope (which can happen if the airflow is restricted) then the thermal overload will switch off the elements. If you need a heater to produce a higher temperature lift, or if the heater is part of a process re-circulation system, let us know and we can advise you on a solution. 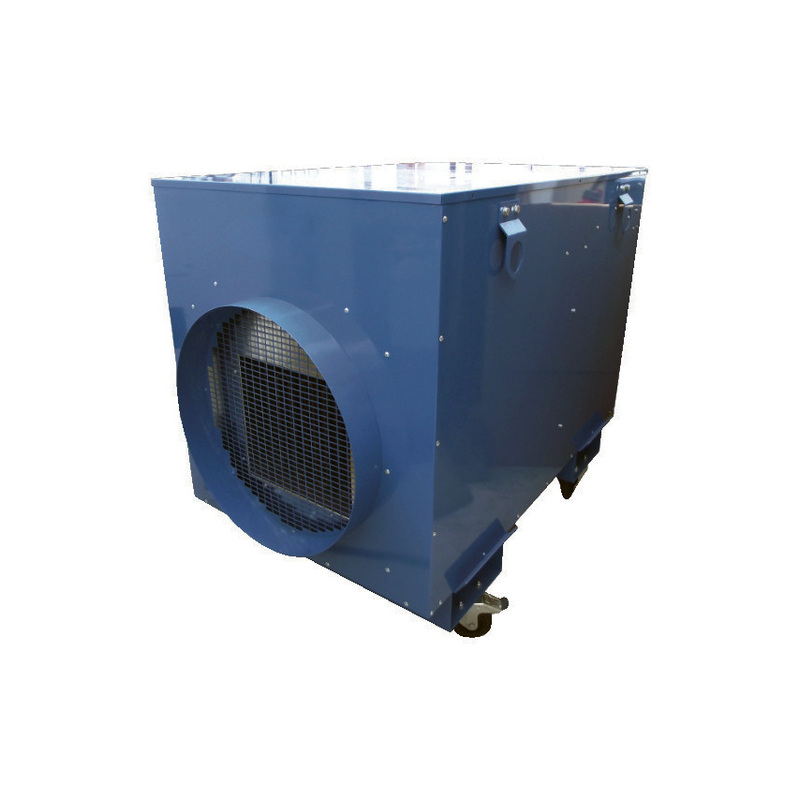 The heat is dispensed efficiently and in a concentrated way to the ambient air by a powerful fan. All appliances are VDE checked and thermally protected. The heating elements have a stainless jacket and the casing is manufactured from galvanised steel sheet, which is then stove-enamelled , resulting in durable and robust industrial electric fan heaters. As no vapours,exhaust gasses or odours are given off , as well as no naked flame- which is very important these days as many building insurance policies insist / have banned a naked flame heaters, due to fire risk, and often make in mandatory for insurance cover for a building that these type of direct fired warm air heaters are not used. These industrial electric heaters can be used in many applications that direct fired diesel or gas heaters cannot. Industrial Electric Space Heaters -How to calculate what your heat requirement is for a given area ? Energy input (kW) x pence per kWh= running cost. The calculation above is based on 14 Pence per kWh – please check with your current electricity bill for the exact hourly rate you are currently paying. Delay start -Programmable On feature – This feature enables the user to postpone the starting time of the industrial electric heater by up to 99 hours. Delay stop – Programmable Off feature – This feature enables the user to extend the operation of the industrial electric heaters by up to 99 hours. Post ventilation – This feature (setting time between 1-9 minutes) enables the heater to cool down before eventually switching off. This saves and utilizes the energy to it’s maximum, as the residual heat is fully utilized, and blown into the area that is being heated. Ventilation only mode – This unit can also be used in a ventilate only mode which is useful in the summer months to move hot or stagnant air. Digital Temperature Control – These industrial electric heaters can automatically control the room temperature up to a maximum of 35 Degrees C. The heater will automatically come on , if the room temperature falls under the desired temperature you select ( up to and including 35 Degrees C) , the heater automatically switches off when that temperature is achieved. The “FHNXG” industrial electric heaters , benefit form a handle that makes moving and transporting the heater easy. 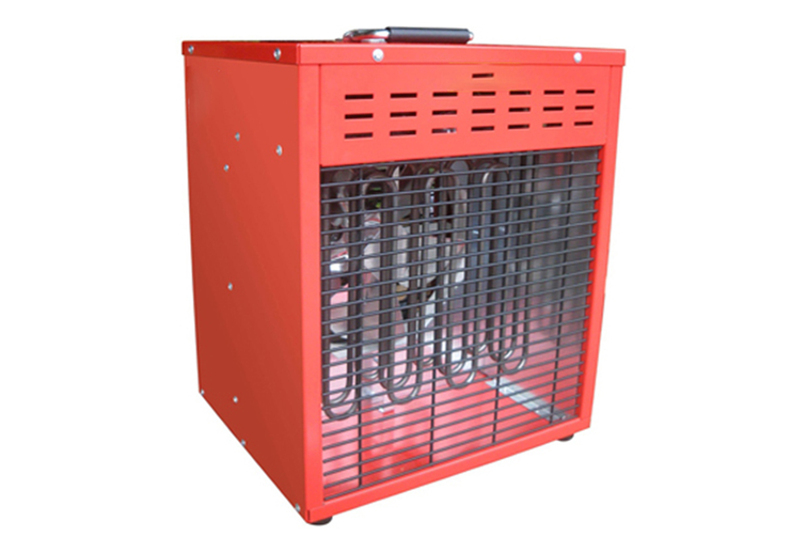 This handle also also doubles as a security rail which prevents damage from being dropped or hit by another object, which can often happen on site , especially building sites.These industrial electric heaters are also stack-able, ensuring a small area is required if the units are put into storage whilst not in use, which is another handy feature of these electric heaters. There are two heaters within this industrial space heaters electric range , the first has a maximum output of 18kW , this industrial electric heater is designated the “FHEHT18” , or we have the “FHEHT30” model, which will do maximum heat output of 30kW of output.Both of these industrial electric heaters require a 3 phase electrical supply , and should only be used in door or protected from the elements. 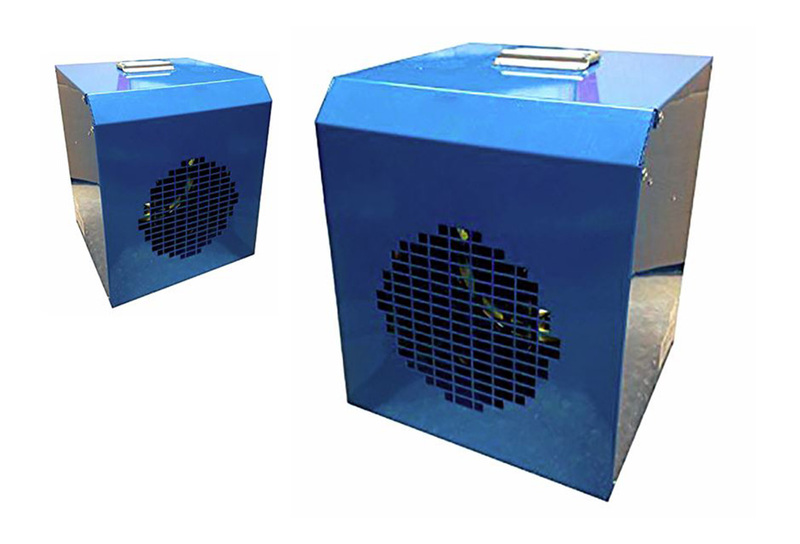 These Industrial electric fan heaters can operate in heating mode (either full or half power) and in ventilation mode (with heat elements turned off) and can utilize a flexible warm air duct , of up to 15 metres in length as well as a remote thermostat and controller if so required by site conditions. or can be used in just a free blowing configuration. Both of these industrial electric space heaters comply with the following standards: EN 60335-1, EN 60335-2-30, EN 62233, EN 55014-1, EN 55014-2 and meet the requirements of European directives 2006/95 / EC, 2004/108 / EC, 2011/65/EC. Fully serviceable with full spare parts availability our industrial electric heater range was conceived to offer the price benefits of a Chinese import coupled with German build quality, but UK built. All heaters in the range come with same heavy duty build and feature adjustable thermostats, mains plugs & leads, over temperature protection and full warranty as standard.Built to withstand industrial use using the same high specification of materials and production methods this extensive range has something to suit every application and is an ideal safe, clean, fume free electric heating alternative to gas and diesel heaters. 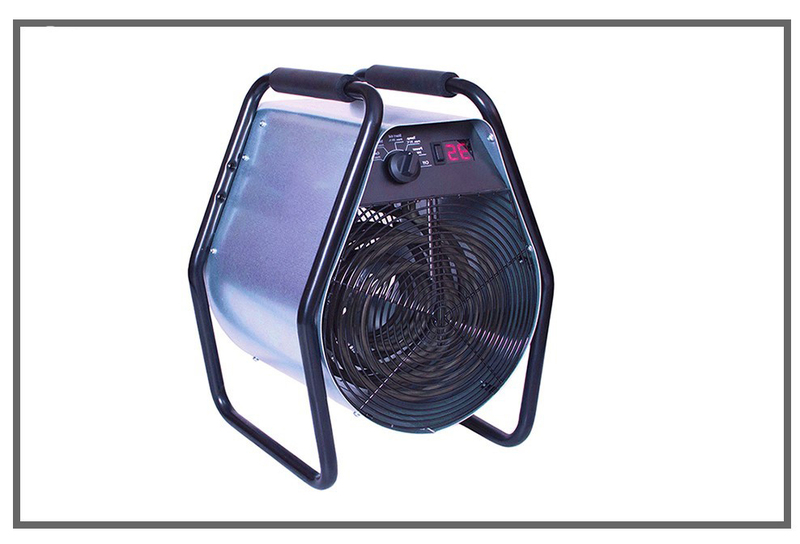 This 3kW Industrial Fan Heater , is a robust and sturdy solution to heating small areas. These electric heaters have an internal room stat, that allows you to control the temperature in the room from 0 Degrees to 40 Degrees C, which also makes them a great solution as frost protection heaters. As they also available in 110 Volts, the are a great heater for building sites and building huts to provide heat to keep the workers happy , and/or to use the warm air to help cure building materials , such as plaster , concrete, paint etc and speed up the building progress. The all new FHVH3 is a powerful 230 volt electric fan heater is designed for use at events and makes a perfect electric marquee heater and other less industrial applications.By using the very latest in EC fan technology with a powerful forward curved impeller and directional lourve, the FHVH3 delivers warm air at much greater velocity than traditional 3kW industrial electric fan heaters. A unique new plenum design also ensures maximum heat transfer from the element to the air for increased heat and efficiency. withstand the rigours of daily site use. Other useful features include thermostatic control, recessed control and over temperature safety control. 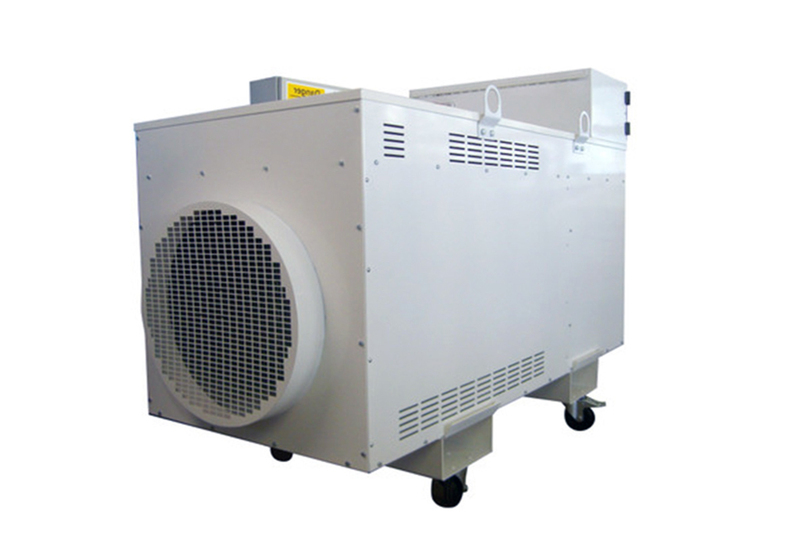 A powerful 16 Amp electric industrial heater designed to deliver 9kW of heat. Built to withstand the rigours of regular site use with features including an adjustable thermostat and over temperature protection as standard while the optional single or double spigot outlets can provide warm air either along 10 Mtrs of ducting or to two separate area’s. A clean, odourless and fume free electric heating alternative to gas and diesel heaters. 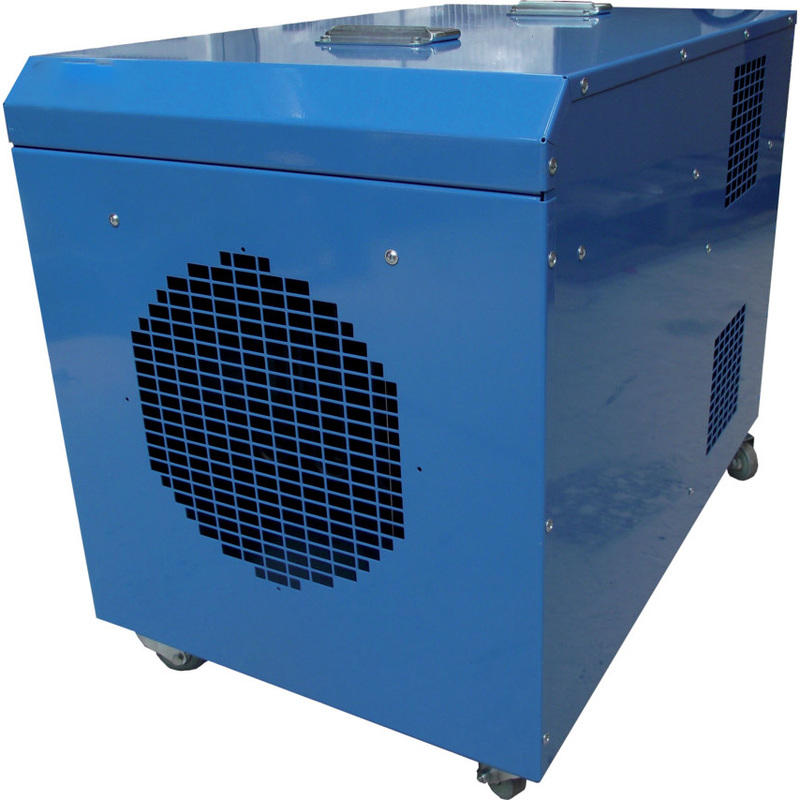 A powerful 32 Amp industrial fan heater that offers 18kW of heat. 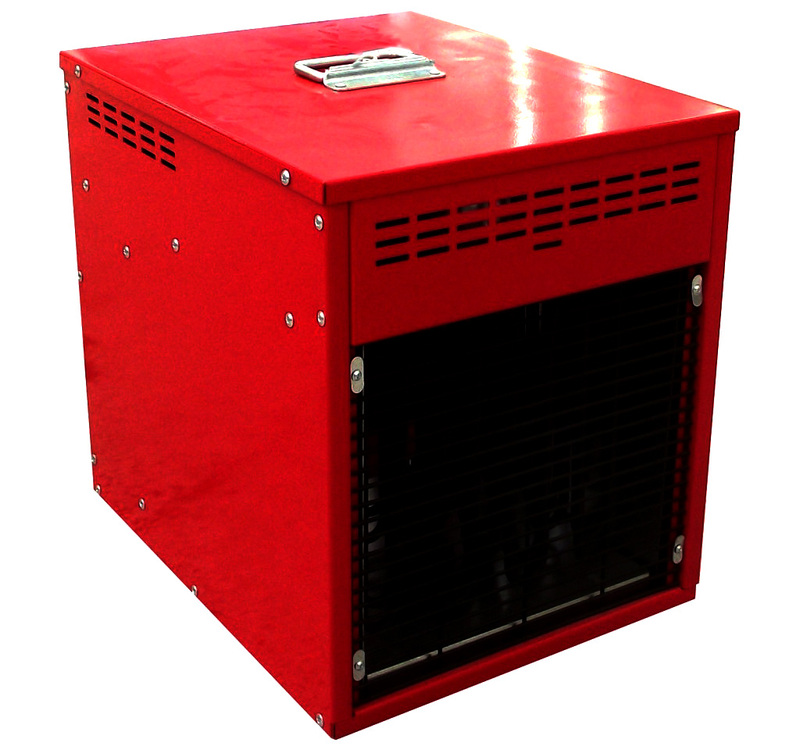 Designed and built to withstand the rigours of regular site use comes complete with features including an adjustable thermostat, over temperature protection and lockable castors while the optional single and multiple outlets allow the FHE29 to deliver warm air either along up to 15 Metres of ducting via one warm air distribution hose or to up to 4 separate areas, with use of the optional 4 way distribution spigot . 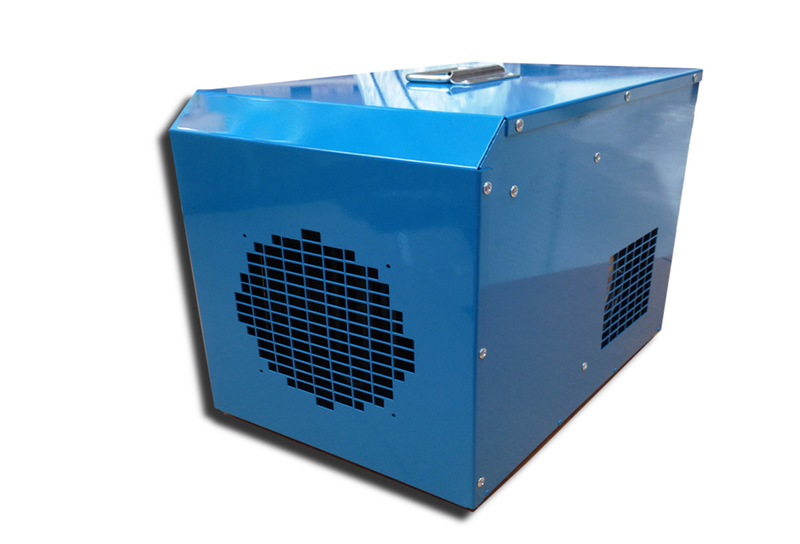 A clean, fume free and odourless warm air heating alternative to gas and diesel heaters. The most powerful 63 Amp industrial electric fan heater available. Designed and built for industrial use the FHE42 features variable heat output, 24 Volt control circuit for safety, remote thermostat socket, spigot, over temperature protection and an auto run on as standard. This industrial electric blow heater , with it’s output of 63kW has been designed for heavy duty warm air heating applications. Ideal for use in shipping, surface coating or large scale heating applications; the FHE63 features a powerful contra rotating fan motor for pumping heat down long lengths of ducting, a heavy duty build, thermostatic control, over temperature protection and lockable castors. An large powerful industrial electric heater originally designed for use in larger industrial and commercial application, such as power stations and aircraft hangers. 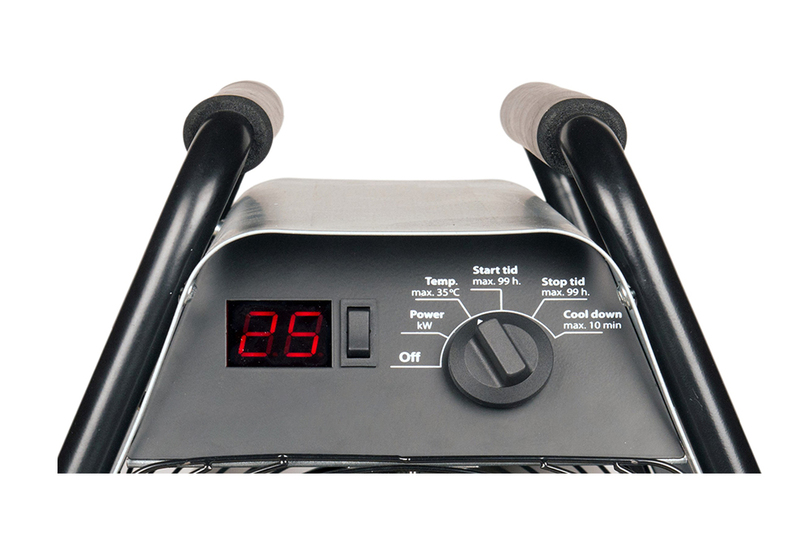 The “FHE110 ” industrial electric blow heater delivers 9000 m³/hr of heated warm air and is constructed from heavy duty and robust materials, multi-stage switching for variable heat output, an adjustable air thermostat, over temperature protection and auto run on as standard are features of this industrial electric heater. Industrial Electric Heaters -The “E” range of industrial fan heaters with outputs from 3 kW single phase to 18 kW 3 Phase are manufactured in German, and as you would expect from product manufactured in this country it is very well made , and uses only the best components within it manufacture. 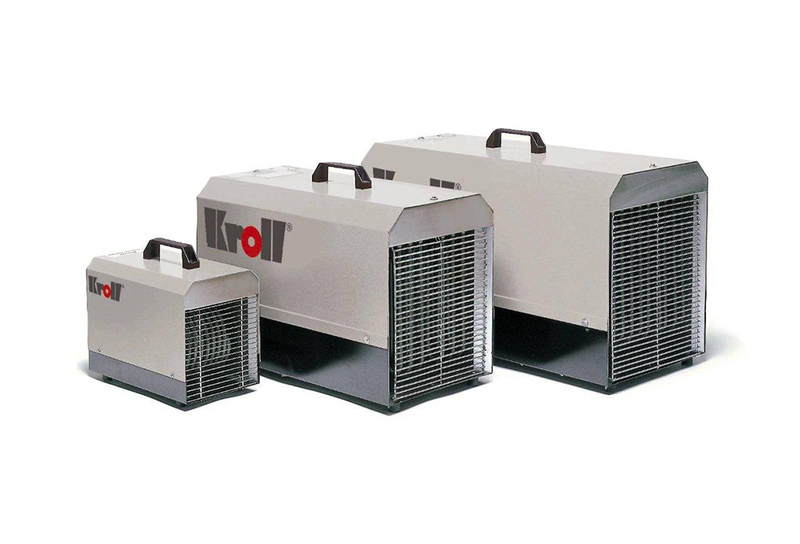 Flexiheat UK is the sole distributor of the Kroll electric heaters for the UK and Ireland markets , and are pleased to offer this range of industrial electric fan heaters to suit both the commercial and industrial electric warm air heating requirements from small to large areas. The Kroll industrial electric heater “E3 model” is a 240 volt, single phase electric heater and with its lightweight design is an ideal solution to heating smaller rooms ,offices, site huts etc. 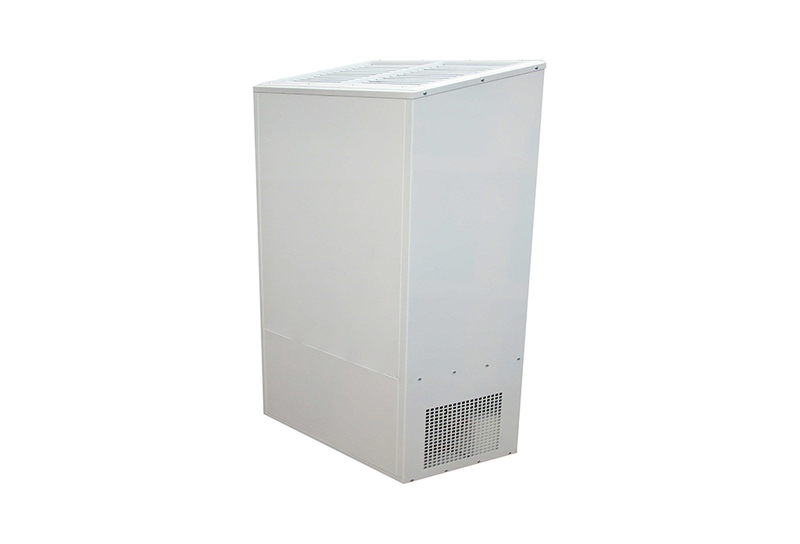 The E8, E12 and E18 industrial electric heater models extend to a 3 phase heater (415 Volt) and are ideal for the larger industrial and construction environments such as; workshops, nurseries, shops, exhibition rooms, warehouse heating, building sites, heat load testing, frost protection, production and manufacturing facilities.The E8 – E18 Industrial fan heater range come with adjustable thermostatic control,and high and low heat settings and all units come with thermal cut-out overheat protection. Insulated handles allow for safe movement and handling whilst the heater is still warm. These Portable Electric Heaters provide comfortable heat in spring and in autumn or if there is a sudden onset of cold weather. They can be used as frost control heater to, thanks to their in-built thermostats. Thanks to their small dimensions, the electric fan heaters can be taken everywhere. You will find a place for them even in a very confined space.